On 13th October 2015 the House of Lords debated the EU Referendum Bill at its Second Reading. 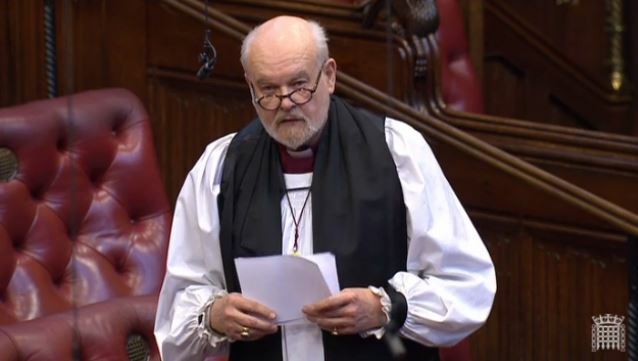 The Bishop of London, Rt Rev Richard Chartres, spoke in the debate. “Your representative owes you … his judgment; and he betrays instead of serving you if he sacrifices it to your opinion”. I hope that as the referendum debate gets under way, focusing on the questions that have now been decided on in the form they appear in the Bill, it will be made clear that this really is a once-in-a-generation event. I also hope that, although the national interest of the country will inevitably occupy centre stage, we shall not forget that there are wider considerations. We are debating our future relations with the Union, not with Europe as a whole. As western hegemony fades and gives way to a more multipolar world and the memories of World War II recede to be replaced by a different sense of the economic, political and ecological challenges that we face, I hope that the debate will be wide enough to make a contribution to what in any case is necessary: the reimaging of Europe. It surely is not a case of Britain versus the rest, but a proper articulation of anxieties and an agenda for reform that is widely shared by other countries in the Union. The noble Lord, Lord Jay, has already made the point that the question of how members of the eurozone relate to the other members of the Union clearly demands new thinking. “a laboratory … atop a vast graveyard”. Our present situation is not the result of any historical inevitabilities; it is just one of many possible outcomes of the protracted 20th century European civil war. Our task in this referendum is to be active and creative partners in identifying afresh the resources to establish a foundation for the common values and principles of a Europe that is still a project in the building. The Church of England, in partnership with the Church of Scotland, hopes to contribute to this new thinking by hosting a blog which has recently been launched, entitled Reimagining Europe. The intention is to provide a platform for faith-informed debate. Reimagining Europe has no editorial line. I believe that prelates and parsons should not aspire to the influence that is proper to the partisan, so there is no place in this blog for telling people how to vote. But we should not shrink from seeking to enhance public understanding of an issue that many find confusing and divisive, but which is one of extraordinary significance. There must be more to this referendum than a calculation of the temporary individual economic benefit or disbenefit of membership of the Union in its present form.